The five member canvassing board slowly plowed through 161 ballots. At the end of the day, Sen. Norm Coleman increased his lead over Al Franken from 188 to 264 votes. For five hours, the board squinted, stared and giggled as members tried to determine voter intent. In some cases, it wasn't that difficult. "It seems pretty clear that that's a vote for Sen. Coleman. It could have been more emphatic, but it's more than a stray mark," said Minnesota Supreme Court Chief Justice Eric Magnuson. In other cases, it was harder. "I can't tell whether it means that they're trying to tell us that they goofed when they went to vote for Franken," said Ramsey County Judge Kathleen Gearin. In most cases, the board ruled unanimously. 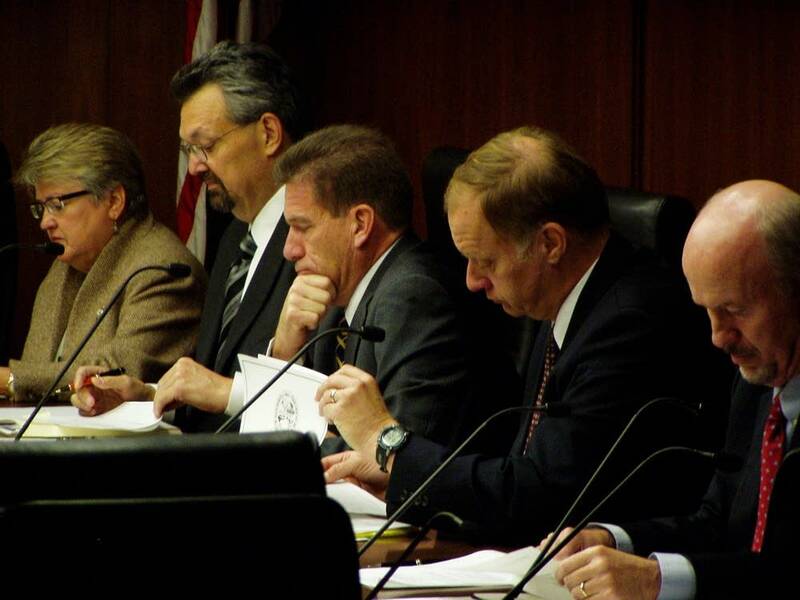 But there were instances when Secretary of State Mark Ritchie, Minnesota Supreme Court Justices Eric Magnuson and G. Barry Anderson and Ramsey County Judges Kathleen Gearin and Edward Cleary disagreed. In those cases, members would work to sway the others. In one case Justice Anderson made the case for a ballot. "If we were having a contest here, the vote for Senator Coleman would finish last, but I think it's sufficient intent," said Anderson. In that case, Coleman received a unanimous vote. A few times, the members split their votes. As the day wore on, the process moved more quickly. Members also set a precedent on certain ballots. They tossed out ballots that had a voter's initials next to a correction. But initials and other names on the write-in portion of the ballot were OK. On day one, Brett Favre, Chuck Norris and Mickey Mouse all received multiple write-in votes. "Mr. Secretary, do we know how well Mickey Mouse did overall," asked Magnuson. "He failed to file the proper paperwork to have his ballot counted, so I can't answer that," explained Ritchie. Kidding aside, it's clear the board understands the stakes in a race that has Coleman with a razor thin margin lead over Franken. Coleman picked up a bulk of the votes on Tuesday, mostly because the board reviewed Franken challenges. The margin could shift once the board moves into the thousand or so Coleman challenges. The large number of challenges continues to concern board members like Judge Gearin. "There are some areas where that it's not even questionable, and yet we're spending time looking at it. Where there is just the tiniest itty bitty little dot in one box and the other box is totally filled in. I'm disappointed. I don't think the campaigns have in fact gone through these as seriously as they should have," said Gearin. The attorneys for both campaigns say they will reduce more challenges now that they know how the board will rule. Franken attorney Marc Elias said knowing the board's strike zone will make things easier for the campaign. "We will look in light of the rulings today and what challenges we can withdraw, so we can adjust, and we will also look at potentially other ballots that now may need to be added to the pile based on the board may now consider those," said Elias. Coleman's campaign already reinserted about 200 challenges it had earlier withdrawn. Coleman attorney Tony Trimble said he restored challenges after learning of the board's intent on some ballots. For example, initials on a ballot or x marks over filled in ovals will likely be back in play. "If that is the law as they're interpreting it and applying it, we want to fit within that and appreciate that opportunity," said Trimble. Secretary Ritchie said he wants the board to complete its work on the challenged ballots by Friday, but he isn't certain whether the board will declare a winner. One sticking point is the uncertainty over the fate of wrongly rejected absentee ballots. The Minnesota Supreme Court will hold a hearing today to hear a motion by Coleman's campaign to prevent local elections officials from sorting and counting wrongly rejected absentee ballots. Coleman's attorneys want a uniform standard for determining such ballots. But language in their court filings indicates that they don't want rejected absentee ballots included in the recount at all. Franken's attorney says Coleman is trying to suppress the vote. Ritchie said the disagreement means it could take some time to know the winner. "We will not declare a winner on this race until we are certain that the numbers that we are signing are names to are the most accurate that we can humanly do and that will certainly take sorting out the challenges and some of the other issues that have come up," said Ritchie. Ritchie added that he doesn't have a self-imposed deadline to declare a winner. The board meets again at 9 a.m. this morning to resume its work.